Portland, Oregon — Despite an early stunner by Jessica Fishlock, Portland Thorns FC put together a dominant performance in a 3-1 win against their Cascadia rivals, Seattle Reign FC, before a sellout crowd of 21,144 at Providence Park. With the win, the Thorns clinch second place in the league and earn a home semifinal. With the Reign taking third, that playoff will be a rematch of this game. Fishlock put the Reign on the board first in the fourth minute with a beautiful effort from the top of the 18. She got on the end of a short forward pass from Elizabeth Addo, took a few touches to get around Emily Menges, and sent the ball sailing to the far post past Adrianna Franch. Indeed, Portland started knocking on the door in the following ten minutes. The first close call for the Reign came in the 18th minute, as Christine Sinclair shook off four Seattle defenders in the penalty area and sent a sideways pass to Caitlin Foord in front of goal. Lydia Williams was there, diving off her line to smother the ball before her fellow Australian international could get a shot off. Ellie Carpenter almost notched one in the 25th minute, making a solo run up the right and sending in a screamer from outside the box. It sailed over Williams to the far post, but hit the crossbar. After knocking for a good chunk of the half, Portland finally equalized in the 30th minute. Midge Purce sent in a pinpoint cross for Christine Sinclair at the edge of the six-yard box. 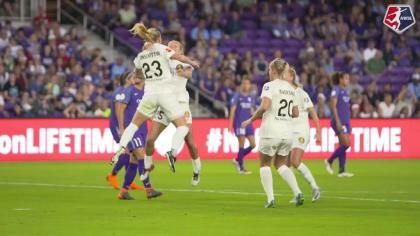 Christen Westphal made a tackle to knock the ball free from the Canadian captain, who fell to the ground — but Horan was crashing the box and pounded a rocket to the back of the net. “We got the first goal and we just kept going and going,” said Horan, “and just the way we reacted was incredible.” The momentum continued to build for the Thorns, and they would end the half with 61% possession. Nonetheless, despite a handful of half-chances, they couldn’t find the go-ahead goal, and the teams went to the locker rooms level. Portland came out swinging in the second half, and Tobin Heath put her team up 2-1 in the 49th minute, with yet another long-range stunner. She picked up an errant pass in the midfield, drove toward the penalty area, and with Foord making a diagonal run in front of her to stretch the Reign defense out of shape, sent a curling shot past Williams. After going down a goal, the Reign started to mount something of a comeback effort. “I think once we got down, we actually started playing,” said Taylor. “It was more the Reign that we know. So I think that’s a good positive to take into this next week.” One chance came in the 66th minute, when Steph Catley served a cross in from the left, the Thorns defense didn’t immediately clear it, and Rumi Utsugi pounced to send in a shot — but her effort was way off target. Despite some renewed life from Seattle, though, Portland continued to take the lion’s share of possession and scoring chances. Foord came close several times, including once on a transition play where she had Williams one-on-one, but the Seattle keeper came up big to tip the ball over the bar. Numerically, the Thorns dominated. They won in just about every category: possession (59.7%-40.3%), passing accuracy (74%-62.4%), chances created (12-6), shots (15-6) and total passes (443-303). That dominance finally widened the Thorns’ lead to a comfortable 3-1. Portland notched their third in the 82nd minute with the Horan special — a header goal off a service by Heath. The winger sent a corner kick to the six-yard line, where Horan had plenty of space to leap and head the ball past Williams. Horan finishes the regular season with 13 goals, good for second in the Golden Boot race, pending the rest of the weekend’s games. Seattle had a couple more half-chances, but nothing that got through Portland’s back line. After four minutes of stoppage time, the whistle blew, and both teams’ playoff destinies were set. Though next week’s semifinal will again pit the Thorns against the Reign at Providence Park, both teams agree next week will be a very different game. The Reign came into the match with 12 shutouts, tied with the 2017 Courage for the most in NWSL history, but were unable to establish a new record. Williams came into the match with 10 shutouts and could’ve tied Franch’s individual single-season record of 11. The Reign finish the regular season with just 19 goals allowed, tied for the fewest in NWSL history (set by the 2016 Reign in a 20 game season). Their goals against average for the season is .79, the lowest in NWSL history. The 2018 Courage have allowed just 17 goals this season, so they could finish with a better defensive record than the Reign, depending on how Saturday night’s regular season finale vs. the Dash turns out. The Thorns now have an opportunity to host throughout the playoffs — as the 2018 NWSL Championship will be held at Providence Park. If they win their semifinal, they’d be in front of their loud and large home crowd for the final. The Thorns finished the season on a 7-1-1 stretch run, with the the only loss coming to the first-place Courage. The Reign had a six-game unbeaten stretch snapped with the loss. The Reign and Thorns have never met in the playoffs. The Reign hold the season series edge, having gone 2-0-1 against the Thorns this season. The all-time series is split between the two teams at 8-8-3. The Thorns were without Hayley Raso, who suffered a back injury on August 25, and is out for the season. Still recovering in Washington, D.C., Raso is not back with the team, but she was saluted by the Riveters during and after the game. The Reign, who had been in second place for most of the season, needed just a draw to clinch the No. 2 seed, but lost on the road to fall to the No. 3 seed. They will now have to head back into enemy territory for next weekend’s semifinal. The win means the Thorns will finish the regular season at 12-6-6 with 42 points. The Reign dropped to 11-5-8 and 41 points with the result. Match ends, Portland Thorns 3, Seattle Reign 1. Second Half ends, Portland Thorns 3, Seattle Reign 1. Substitution, Portland Thorns. Andressinha replaces Tobin Heath. Corner, Seattle Reign. Conceded by Emily Sonnett. Substitution, Seattle Reign. Jaycie Johnson replaces Elizabeth Addo. Substitution, Portland Thorns. Tyler Lussi replaces Caitlin Foord. Attempt blocked. Jessica Fishlock (Seattle Reign) left footed shot from outside the box is blocked. Assisted by Jasmyne Spencer. Goal! Portland Thorns 3, Seattle Reign 1. Lindsey Horan (Portland Thorns) header from very close range to the bottom left corner. Assisted by Tobin Heath with a cross following a corner. Attempt saved. Caitlin Foord (Portland Thorns) right footed shot from the right side of the box is saved in the top centre of the goal. Assisted by Midge Purce. Attempt missed. Jodie Taylor (Seattle Reign) right footed shot from outside the box is close, but misses to the right. Assisted by Jasmyne Spencer with a headed pass. Attempt saved. Caitlin Foord (Portland Thorns) left footed shot from the centre of the box is saved in the centre of the goal. Substitution, Seattle Reign. Beverly Yanez replaces Rumi Utsugi. Offside, Seattle Reign. Stephanie Catley tries a through ball, but Jasmyne Spencer is caught offside. Attempt missed. Rumi Utsugi (Seattle Reign) left footed shot from outside the box is too high. Assisted by Jessica Fishlock. Corner, Portland Thorns. Conceded by Jessica Fishlock. Attempt blocked. 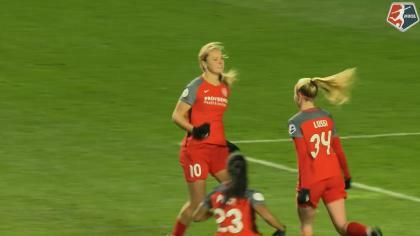 Emily Sonnett (Portland Thorns) header from very close range is blocked. Assisted by Ellie Carpenter with a cross. Corner, Portland Thorns. Conceded by Morgan Andrews. Attempt blocked. Midge Purce (Portland Thorns) left footed shot from outside the box is blocked. Assisted by Celeste Boureille. Elizabeth Addo (Seattle Reign) is shown the yellow card. Christen Westphal (Seattle Reign) wins a free kick on the right wing. Delay in match Celeste Boureille (Portland Thorns) because of an injury. Jasmyne Spencer (Seattle Reign) wins a free kick on the left wing. Goal! Portland Thorns 2, Seattle Reign 1. Tobin Heath (Portland Thorns) right footed shot from outside the box to the top right corner. Attempt blocked. Christine Sinclair (Portland Thorns) right footed shot from outside the box is blocked. Assisted by Caitlin Foord. Delay in match Jodie Taylor (Seattle Reign) because of an injury. Attempt blocked. Caitlin Foord (Portland Thorns) right footed shot from outside the box is blocked. Assisted by Emily Sonnett. Attempt saved. Jodie Taylor (Seattle Reign) right footed shot from the left side of the box is saved in the centre of the goal. Assisted by Elizabeth Addo. Goal! Portland Thorns 1, Seattle Reign 1. Lindsey Horan (Portland Thorns) right footed shot from the centre of the box to the top right corner. Attempt blocked. Christine Sinclair (Portland Thorns) right footed shot from the centre of the box is blocked. Assisted by Midge Purce with a cross. Attempt missed. Jessica Fishlock (Seattle Reign) right footed shot from outside the box is close, but misses to the right. Assisted by Elizabeth Addo. Attempt blocked. Caitlin Foord (Portland Thorns) right footed shot from outside the box is blocked. Assisted by Celeste Boureille. Ellie Carpenter (Portland Thorns) hits the bar with a right footed shot from the right side of the box. 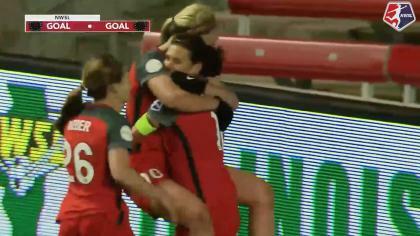 Assisted by Lindsey Horan. Goal! Portland Thorns 0, Seattle Reign 1. Jessica Fishlock (Seattle Reign) right footed shot from outside the box to the top left corner. Assisted by Elizabeth Addo.